LAHORE :Punjab Minister for Specialised Healthcare and Medical Education Khawaja Salman Rafiq has said that Punjab government would welcome cooperation of international institutions with regard to provision of best health facilities to the people, capacity-building of the medical staff and introduction of modern technology in the teaching hospitals. He stated while talking to a joint delegation on Wednesday, according to a handout issued here. Gift of Life International Chief Executive Rob Raylman, PCHF CE Farhan Ahmad and other office-bearers of both institutions were included in the delegation. 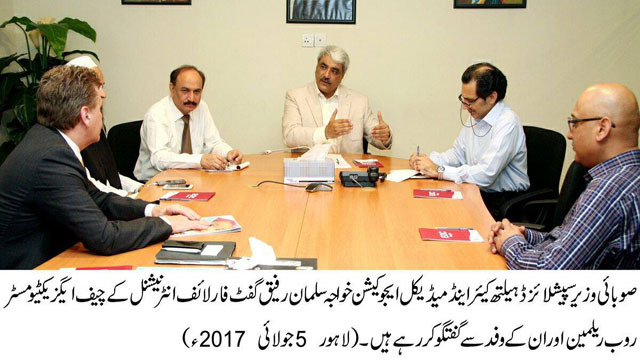 Institute of Child Health and Children Hospital Lahore Dean Prof Masood Sadiq was also present.